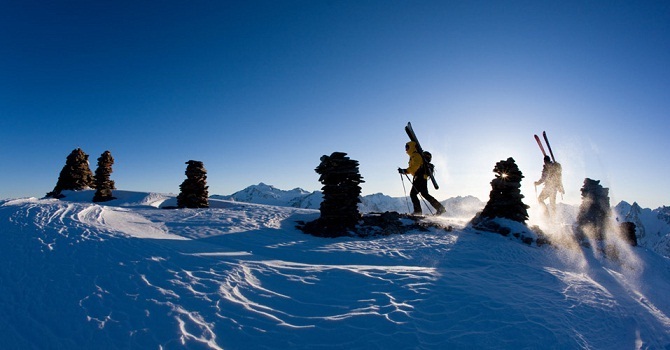 The Otztal mountains of Austria offer a great area for ski touring, that is peppered with 3000m peaks. The 'Tour du Vent' ski tour is a true classic ski tour which tackles the most famous mountains surrounding the Otztal valley. On the third day of skiing, you visit the actual site where the famous iceman was discovered, high up on the Austrian-Italian border. 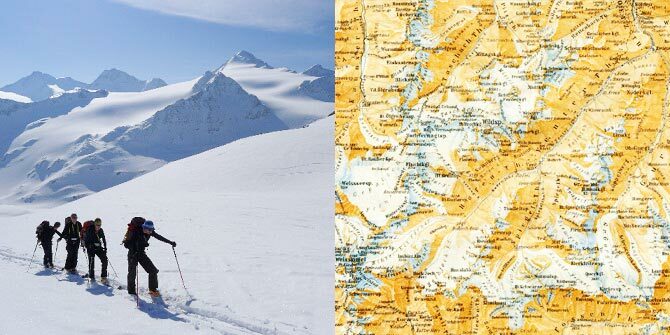 During the week you ski tour across many glaciers and high passes, taking in many of the key summits of the region. The main peaks that are skied include Similaun 3606m, Finailspitze 3514m, Weisskugel 3739m, Fluchtkogel 3500m, and Wildspitze 3774mn. 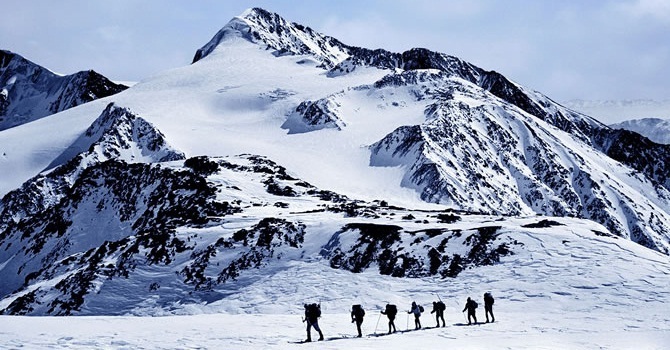 Previous touring experience is required, but this is of a similar level to the Silvretta ski tour, and a good level of fitness is essential. The accommodation in the mountains is in huts. These are looked after by a guardian and their team, and all bedding is provided, as is a good evening meal and breakfast. Packed lunches can be obtained in the huts, though many prefer to ski light, snacking on cereal bars to keep a steady rhythm going. The itineraries are for guidance, but should give an idea of what you can achieve during the week. Each week this course runs slightly differently to cater for your preferences, the conditions, and where the best weather and snow is to be found. This flexibility allows you to have the course tailored to your needs. This trip is lead by Francois (see photo below), who is an IFMGA mountain and ski guide. He has worked with Icicle for over a decade, and spends most of the year in the Alps. 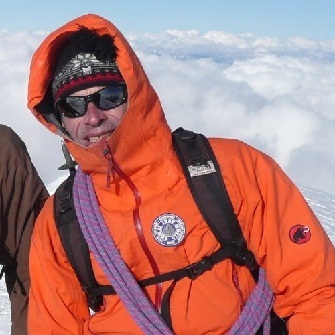 Francois is a keen ski tourer and ice climber, who lives in the Vercors massif. Satuday - Travel to the village of Vent in the Austrian Otztal, and spend the night on a half board basis in a local hotel. Meet the rest of the group. Sunday - In the morning, the guide will make final kit checks, and brief you on the plan for the day. The first day is relatively easy, to allow you to get your ski legs back, and to practice with avalanche transceivers. The aim for the day is to skin up to the Martin-Busch hut at 2501m, which involves about 3 hours of ascent. Monday - An early start to head up to the summit of Similaun 3606m, which takes about 4 hours from the hut. From the summit, you ski down to the Similaun-hutte mountain hut, where you spend the night. The day involves 1105m height gain, and 600m height loss. 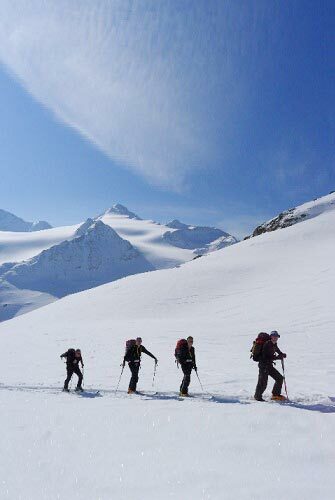 Tuesday - Another early start to ski up to the Tisenjoch col, where the Iceman of Similaun was discovered. From there you may even continue to ascend the north east ridge to the summit of Finailspitze 3514m. You ski down Hochjochferner, followed by the short climb up to the Schonen Aussicht mountaim hut. Today you gain 680m, and lose 860m. Wednesday - The objective today is Weisskugel 3739m, which is reach by the short climb to the col between Am Hintern 3270m and Egg 3219m, followed by a short descent on Hintereisferner and the climb to Hintereisjoch. From here it is a short ascent to the summit of Weisskugel by its south ridge, then a long ski down ro the Hochjoch Hospiz hut. This is a big day with 1360m ascent, and 1790m of descent. Thursday - The tour then heads to Kesselwandferner via the Gularjoch pass, before ascending towards the summit of Fluchtkogel 3500m. You ski down the huge Mitterkar glacier, to reach the Vernag hut at 2755m. The height gain for the day is 1100m, and loss is 760m. Friday - It's the final day, and passing ober the Grosser and Keiner Vernag glaciers, you ascend to the pass at Brochkogel 3423m. Then there is a long traverse taking you to the foot of Wildspitze, from which you ascend to the summit at 3774m. The long descent takes you all the way back to the village of Vent where you spend the night in a hotel. The height gain for the day is 1100m, and the loss is a huge 1870m. Saturday - Breakfast in the hotel, then you are free to depart for the return flights home. Standard Course Inclusions: 1) IFMGA Mountain Guide(s) for six days, 2) Pre course information booklet, 3) Equipment discount voucher for UK shops, 4) Two nights half board accommodation in Vent, Austria (inc. bedding & towels), 5) Five nights half board accommodation in mountain huts including three course cooked evening meals. 6) Free 36 page technical Course Instruction Booklet. Exclusions: 1) Travel to and from Vent, Austria, 2) Cable Cars and valley transfers (budget on £60), 3) Ski hire, 4) Personal laundry, telephone calls, lunches, & any purchases in mountain huts / hotels / restaurants, 5) Activities insurance, & excess baggage charges, 6) Saturday pre-dinner drinks & Friday celebratory meal & drinks. The trips all start in Vent in Austria, which is easily accessed by train, from the nearest airport of Innsbruck, or slightly further away to fly to Zurich.